2) We will be getting set up and ready to go early so that we can get as much game-play in as possible! Gates open at 8am, Game starts at 10am. Be sure that you arrive with plenty of time to fill out your waiver, pick up your paint and gear up before 10am! 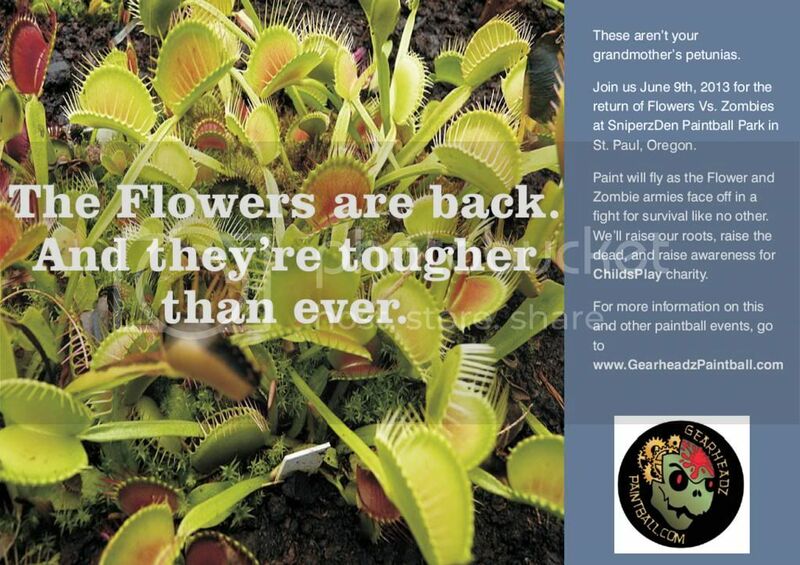 3) Costume Contest: We are giving out prizes to the best Zombie and best Flower at the event. Get creative! 4)Toy Drive: Help make a kid's hospital stay a little less awful. Bring NEW, unwrapped toys (no stuffed animals please), games and video games to the event. You get 5 FREE raffle tickets for every toy donated. 5) Raffle: Don't want to bring a toy? No problem - tickets for the raffle will be $1 each, with proceeds being donated to Child's Play Charity (to help provide toys for even more hospitalized kids)! 6) Share & Invite! Please share this event with your paintball family. It is a lot of fun and will be a great day of paintball at SniperzDen Paintball park. We'll see you there!